Meat and Potatoes Pie is a hearty, one-pie, version of the humble Yooper Pasties; flaky butter crust filled with lean ground beef or venison, diced potatoes, carrots, rutabaga, onion, and various spices. Guaranteed to put a smile on you and fill your belly, today’s Meat and Potatoes Pie recipe is in recognition of Pi Day/Pie Day and is the second installment of Celebrating Food 2017; a group of top bloggers picking one food holiday per month to enjoy together in a virtual party. Please scroll down past the recipe to get a list of the other wonderful pie recipes for Pi Day 2017. Food memories loom large in my life. So many of my most tangible memories surround food; making it with or for loved ones, eating it with loved ones, talking about it with loved ones. I’m made -in large part- as much by my memories of the the foods I’ve eaten as I am by the actual food itself. My biggest foundation food is the humble Yooper pasty; an Upper Peninsula take on the classic Cornish Pasty. For the record, I’m talking about PASS-teez; meat and vegetable pies that are a regional specialty of the Upper Peninsula of Michigan and not pay-steez which are a specialty of a Janet Jackson, Madonna, and Lady Gaga’s regions. The number of these made by my Grandma’s hands that I have eaten in my lifetime probably extends to the same number as decimal places in Pi. The thing is, pasties are a little time intensive. You roll out innumerable pie crusts and stuff then crimp each one. They’re truly a labour of love. I noticed for the first time ever that the hand-written recipe passed to me by my Grandma has an asterisk near the notes about how to stuff the pasties and a little note scrawled at the bottom in tiny script: “…Or you can fill regular pies with them for pasty pies.” In all my life, I had never done this. I decided to make Meat and Potatoes Pie, because in my heart and in my head, I couldn’t call them pasty pies even if they were basically giant versions of pasties; pasties will always be the hand-held, individual servings of my youth. These Meat and Potatoes Pies, though, have everything I love about pasties minus the extended hands-on preparation time. You still have that flaky butter crust filled nearly to bursting with hearty potatoes, rutabaga, carrots, onion, and lean beef or venison. Since I was already breaking with tradition by making a giant Meat and Potatoes Pie, I went a little crazy and added some fresh thyme to the filling, too. It was a good move. Also a good move was the decision to serve this stick-to-your-ribs Meat and Potatoes Pie with deep, luscious brown gravy. Normally, my family tradition sees us dousing pasties with ketchup. I departed from this a few years ago and tried pasties and beef gravy and loved it. The quick and simple brown gravy served with these Meat and Potatoes Pie, though, comes together quickly while your pie is cooling after baking. Easy as Meat and Potatoes Pie… easier than pi. Rutabagas can be intimidating if you’ve never cooked with them (and in some cases if you can) but never fear! I have some tips! Slice a sliver off one end of the rutabaga so that it stands sturdily on your cutting board. Then use your biggest, sharpest knife to lob it in half. If it’s freaking you out too much to try to hold a slippery, wax covered, round and really hard vegetable while trying to cut it, feel free to whack it in half with a hatchet or an axe. Just don’t do it on your kitchen counter! Once you have the brute opened, lay it on the flat side and dismantle it further so your original sphere is in quarters. Take another little bit off the bottom so you can stand the quarters up on their ends and use another sharp knife to remove the peel from the sides. Voila. The scary little bugger has been reduced to workable vegetable. You can use whichever pie crust you like best, but for the most authentic experience, use the one here. If you’re morally opposed to or terrified of making your own pie crust, you can certainly use a refrigerated, pre-made pie crust. Understand, though, that a Meat and Potatoes Pie has similar requirements to a pasty; it does best with a sturdy but flaky crust. You may find a refrigerated, pre-made pie crust has trouble making it into nice, tidy slices. That’s okay, just be aware. Crimp the edges however you like best, whether it be with a fork or some artistic design, just do crimp them. I like to make this as two very generously sized deep-dish pies but you can certainly divide that down further into three standard sized pies. They will cook a little more quickly, so check on them earlier and more often. They’re done when the internal temperature reaches 160°F. If you’d like to bake one pie and freeze one for later, feel free! Meat and Potatoes Pies are a great freezer pleaser. Wrap the un-baked pie tightly in two layers of plastic wrap, then one of foil. 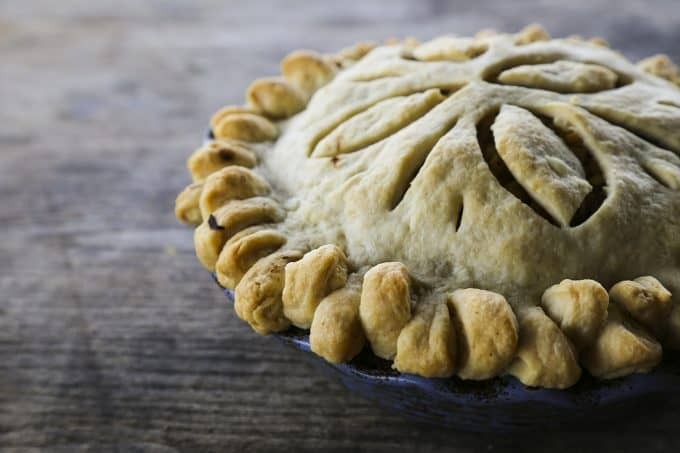 Allow the frozen pie to thaw in the refrigerator overnight before unwrapping and baking. Once again, you’re baking until the inside of the pie reaches 160°F. You need to slice a few vent holes into the top of the pie before baking. You can do this in whatever pattern you prefer. You need to let the Meat and Potatoes Pie rest for at least 10 but preferably 15 minutes before attempting to slice into it. 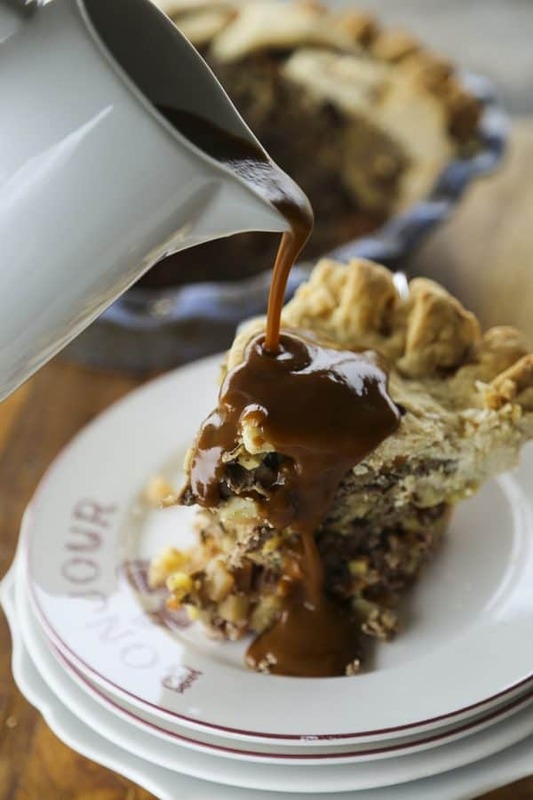 Meat and Potatoes Pie: flaky butter crust filled to bursting with lean beef or venison, potatoes, onions, carrots, rutabaga, and baked to perfection before being topped with luscious brown gravy! ...or enough sturdy pie dough for three double crust pies. Stir together the fat and boiling water in a large mixing bowl (or the bowl of your stand mixer) until the shortening is fully melted and combined with the water. It will probably be a thick, milky white liquid at that point. Add the remaining ingredients and mix together on low (either with a stand mixer or by hand) until a smooth dough forms. Divide in two and pat each half into a smooth disc on a piece of plastic wrap. Wrap tightly and refrigerate while preparing the filling. Cut the rutabaga into 1/4" slices and stack them like a deck of cards. Slice them into 1/4" strips that will then be cut into 1/4" cubes. Peel and dice the carrots, and onions in the same way. Dice the potatoes to 1/4" as well, leaving their peels intact. Combine all diced vegetables in a gigantic mixing bowl. Break the lean beef or venison over the top, add salt and pepper, and use your hands to mix thoroughly. Roll out a 1/4 of your pie crust dough to a diameter a couple of inches larger than the diameter of your pie plate. Transfer the dough round to the pie plate. Repeat with another 1/4 of your dough and the second pie plate. Divide the meat and potatoes filling evenly between the two prepared crusts. Roll out half of the remaining pastry crust and lay over one filled pie. Repeat with the last pastry dough. Tuck the excess dough under and crimp the edges of the pie dough to seal. Transfer to a rimmed sheet pan to catch any juices that bubble over and slice a couple of small vents into the top of each pie. Slide the pans into the oven and bake for 1 hour and 45 minutes to 2 hours and 15 minutes, or until the the internal temperature in the thickest part of the Meat and Potatoes Pie reaches 160°F. Since pasties don’t traditionally get an egg glaze, they won’t be a shiny brown when done, but a deep crispy looking golden brown. Make the vegetable stock by whisking together the boiling water and Vegetable Better than Bouillon or vegetable bouillon. Melt the butter in a heavy saucepan over medium high heat. Whisk in the flour and cook, whisking often until bubbly and fragrant smelling, at least 2 minutes. Whisk in the browning sauce, then the vegetable stock and bring to a boil, stirring frequently. Taste the gravy, adjust the seasonings and serve hot. Be sure to check out all 21 Sweet and Savoury Pies for Pi Day 2017 and beyond! 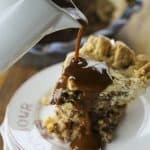 This looks soooo tasty (rhymes with my favorite incorrect pronunciation, btw) and I love the simplified version of a family size pie! Thanks so much for including my angel pie in your collection too! HA! Of course you like the naughty version! I’m so glad you like the simplified version! My whole family would love this pie. It looks so yummy, and your crust is just gorgeous! Thanks, Kara- It’s such an easy crust. Not as tender as a “standard” crust, but it can’t be to hold that much filling, and it’s still very flaky and flavourful! I’m intrigued by your crust process of mixing the fat with boiling water. I made pasties this week. My family’s crust recipe uses cold butter cut in and ice water to maintain fat chunks in the dough, as you would in a standard pie crust. Shucks. Thanks, Marly! I’m sure you’d do beautiful things with a vegan version. Hi just want to make sure…do you use 4 tablespoons of flour for the roux making the gravy? Looks wonderful! That is correct, Julie! I cannot believe I didn’t put that in the recipe. I must have backspaced through it. Oof! I’ve fixed it. I appreciate the question! This looks delicious! Any recommended substitution for the ‘browning sauce’? I’ve never heard of or seen browning sauce in the stores here. Hi Kelly- It’s sometimes sold under the brand name “Gravy Master” or “Kitchen Bouquet” and varies in placement from store to store but is often near ketchup/mustard/pickles or canned broth and soups. If you can’t find it, you can omit it. It adds some depth of flavour and colour that I like in my brown gravy, but is not strictly necessary. Fantastic! I used 2lbs ground elk and 1 lb ground beef. Added a bit of diced zucchini but otherwise made as instructed. The root veggies were still a bit crunchy but still delicious. Gravy made the dish perfect. I will be making this again. Oh for the dough it didn’t mix well with just the butter and water so I partially softened/melted the butter first then mixed with water. I’ve previously made your pasty recipe (after a trip to the UP), and at the request of family members made this meat pie for Christmas 2018 dinner. I used 2# of ground venison and 1# of ground turkey, and followed the directions as printed. I’m not sure that 5 stars adequately describes how utterly delicious this is! I love the texture of the little chopped up veggies, the flakiness of the pastry, the taste of thyme, the gravy (although I actually do like mine with ketchup), basically everything!! My husband says we probably have a new family tradition:) Highly recommend even though it is a bit labor intensive!